Results of the malware scan are available in restore session statistics. Open the Home view, in the inventory pane select Last 24 hours. In the working area, double-click the necessary restore session. Alternatively, you can select the session and click Statistics on the ribbon or right-click the session and select Statistics. Open the History view, in the inventory pane select Restore. In the working area, double-click the necessary restore session. Alternatively, you can select the session and click Statistics on the ribbon or right-click the session and select Statistics. To view the detailed logging of the malware scan, click the Scan Log button at the bottom of the window with restore session statistics. Veeam Backup & Replication will display the most recent logs in a file of 1 MB in size. 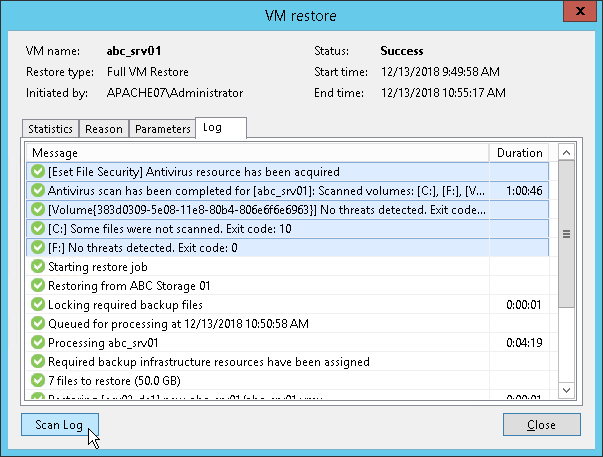 Full logs of the scan are stored on the mount server in the following folder: C:\ProgramData\Veeam\Backup\FLRSessions\Windows\FLR__<machinename>_\Antivirus.